Everybody's Right to Beautiful Radiant Things"
Emma Goldman, undoubtedly one of the most notable and influential women in modern American history, consistently promoted a wide range of controversial movements and principles, including anarchism, equality and independence for women, freedom of thought and expression, radical education, sexual freedom and birth control, and union organization and the eight-hour day. Goldman's advocacy of these causes, which many deemed subversive at the time, helped set the historical context for some of today's most important political and social debates. Goldman's role in securing the right to freedom of speech in America is especially significant. She herself was frequently harassed or arrested when lecturing--if her talks were not banned outright. She worked with the first Free Speech League, which insisted that all Americans have a basic right to express their ideas, no matter how radical or controversial those ideas might seem. Directly out of this work came the founding of the American Civil Liberties Union, setting in motion the beginnings of the modern free speech movement in the United States. Goldman's impassioned advocacy of politically unpopular ideas and causes like free love, anarchism, and atheism earned her the title "Red Emma" and led many of the powerful to fear and hate her. Attorney General Caffey wrote in 1917, "Emma Goldman is a woman of great ability and of personal magnetism, and her persuasive powers make her an exceedingly dangerous woman." But others stressed Goldman's role as an educator, one who in nationwide lecture tours spread modern ideas and practices to a young and provincial country. One newspaper editor described her as "8,000 years ahead of her time." Now, over fifty years after her death, Emma Goldman's commitment to freedom and equality, her political courage and personal resilience, continue to inspire the public--and stir up controversy. 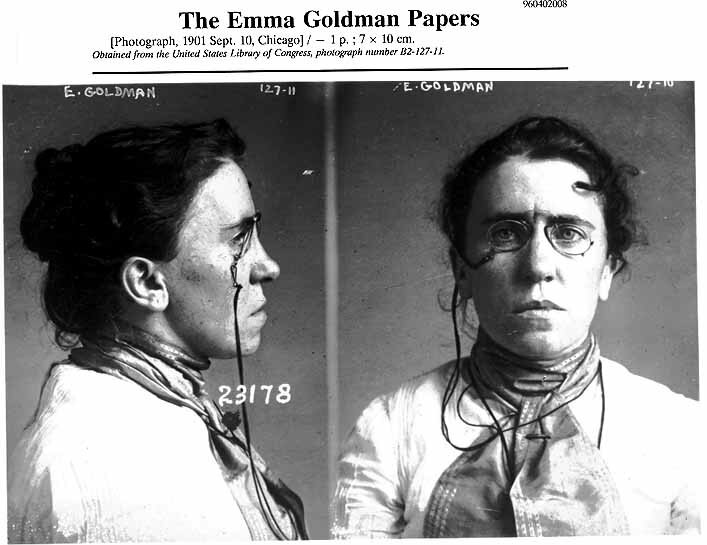 The notorious Emma Goldman, feared and revered, who dedicated her life to the cause of freedom.